Datsuns built in Taiwan under their own brands, YLN and Yue Loong, rather than as Datsuns. I think today they do brand them as Nissan cars. 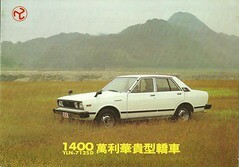 This is the same car we had in North America as the 510 in 1980, and elsewhere as Stanza and other names.